The food blogosphere is chock full o’ Thanksgiving posts right now…what to bake, what to cook, how to make it, when to make it, how to eat it as leftovers, how to set the table, how to clear the table, how to label your plates/bowls…it’s enough to make your head spin, right? My first piece of advice – delegate. In our family, no matter who hosts, we all contribute pretty equally. It’s fair. It’s courteous. It keeps the peace. My second piece of advice – simplify. Easy dishes can be just as delicious as complicated ones, with the upside of having a less stressed host. So, I bring you this dish. The flavors are great and it takes just a few minutes to prep. A bit different from the typical candied carrots offering, but just as good! You deserve a break on Thursday. Preheat oven to 400 degrees. Combine all ingredients in a bowl and mix. Place on a baking sheet or in a roasting pan and cook for about 35-40 minutes, turning twice during that time. This entry was posted in fennel, side dishes. Bookmark the permalink. 2 Responses to Thanksgiving stress? 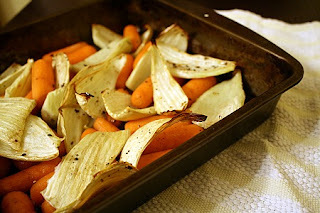 I don’t cook with fennel enough and carrots are one of my favorites to roast – this looks fantastic! Thanks for linking up!